As a self-professed member of the Cumbercollective, it goes without saying that I was desperate to see this film. Having been disappointed with several of Cumberbatch’s other works since the beginning of Sherlock I am delighted to say, that at this late stage in the year, this film has topped my list of my favourite films of 2014. 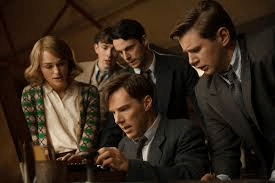 The film, which is based on the true story of Alan Turing, who helped to break the German Enigma machine during World War Two and help the allies win the war, was a gripping and fully enjoyable account of the historical events. The film has everything a potential film goer could hope for; a gripping story line, humour, tear-jerking moments and a truly phenomenal cast. For me, part of the reason I enjoyed this film so much was the stellar line up of actors involved- Benedict Cumberbatch plays one of the best roles of his career as Turing, a socially awkward and often arrogant, however completely loveable mathematical prodigy. He is joined on screen by a supporting cast made up of Keira Knightly, who plays a fantastic role as Joan Clarke, Turing’s partner in crime, as well as the affable Matthew Goode, who is excellent as one of Turing’s team members. It must also be mentioned that Mark Strong, who also recently featured in thriller “Before I Go To Sleep” plays a hilarious part as MI6 Agent Stuart Menzies (for some unknown reason pronounced “Mingus”, which made me laugh more than it should have!) . The film could have been dry at times, as can often be the case with historical dramas butut this film manages to make light of some of the film’s more serious issues. Cumberbatch provides plenty of light entertainment along the way, as he tries to overcome his social issues to contribute to the war effort. What really made this film hit home was the overriding issue of Turing’s homosexuality. The film features a series of flashbacks, and we see a young Turing struggling to come to terms with his blossoming sexuality and when the climax of the films comes to a close, it strikes home just how recent some of these events actually were. The film itself clocks in just short of two hours, although when the end credits rolled, it didn’t feel as if I’d been sitting there much longer than half an hour, so engrossing was the story. The film really draws the viewer in, and you celebrate each high and commiserate each low with each of the characters on the screen. This is such an important factor when a film is quite as long as this one. I’ve only seen it once so far, but I’ll definitely be back. And all I have left to say is, if when the Oscars come round next year, this film hasn’t been nominated for at least half of them, it will be the most heinous of crimes. Posted in Arts and tagged benedict cumberbatch, film review, movie, the imitation game. Bookmark the permalink.